Blindness is one of the most dreaded complications of diabetes. 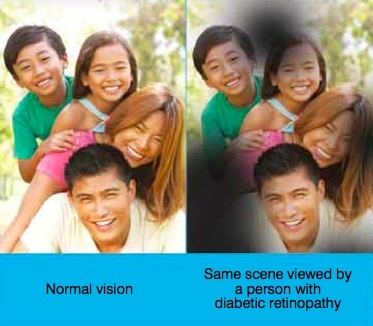 The most common cause of diabetic blindness is Diabetic Retinopathy. Diabetic Retinopathy is caused by abnormal new blood vessels that grow on the surface of the retina. These blood vessels may swell and leak fluid as the condition worsens. The abnormal blood vessels are weak and can easily leak blood into the center of the eye, resulting in blurring of vision. If treated early, good vision may still be recovered. Untreated, the abnormal new vessels eventually cause internal bleeding, retinal detachment or severe glaucoma and optic nerve damage leading to permanent blindness. How can diabetics protect their vision? Controlling blood sugar consistently is the most important thing to do in order to prevent retinopathy from developing or getting worse. Having a regular dilated eye exam by an eye doctor can reduce the risk of getting complicated Diabetic Retinopathy because early treatment can be recommended if necessary. 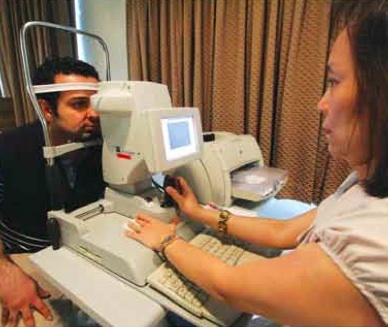 Early retinopathy is best treated with laser surgery. The doctor places hundreds of laser marks on the retina to shrink the abnormal blood vessels. Recently, injections of certain high-tech	medicines	have	dramatically helped reduce the loss of vision from diabetic retinopathy. In advanced cases, you may need an eye operation called Vitrectomy. During a Vitrectomy, blood is removed from the center of your eye. Other procedures may also be done at the same time. Retina and vitreous surgery is very delicate and difficult and should only be done by highly-trained and experienced retina specialists. Eye doctors who prescribe medicines and operate on the eye are called ophthalmologists. Sub-specialists are eye doctors who undergo further training in specific fields like Retina, Glaucoma, Pediatrics, Refractive Surgery, Plastic and Orbit. The ophthalmologists at the ACES Eye Referral Clinics are experienced sub-specialists who work together as a team. The unique ACES TEAM APPROACH gives patients the benefit and convenience of a second or more expert opinions in one visit. Only ophthalmologists who have had special training in retina diseases and surgery should take care of diabetic patients with retinopathy. Dr. Victorio Naranjo Cajita is the first retina specialist in Cebu and is also a member of the ACES CATARACT SERVICE with particular expertise in complicated cases. He completed his Ophthalmology Residency in UP-PGH as chief resident and also completed a 2-year Retina Fellowship at the Schepens Eye Research Institute of the Harvard Medical School in Boston.